Memories of a western-themed hot dog and hamburger joint on Geary Boulevard. 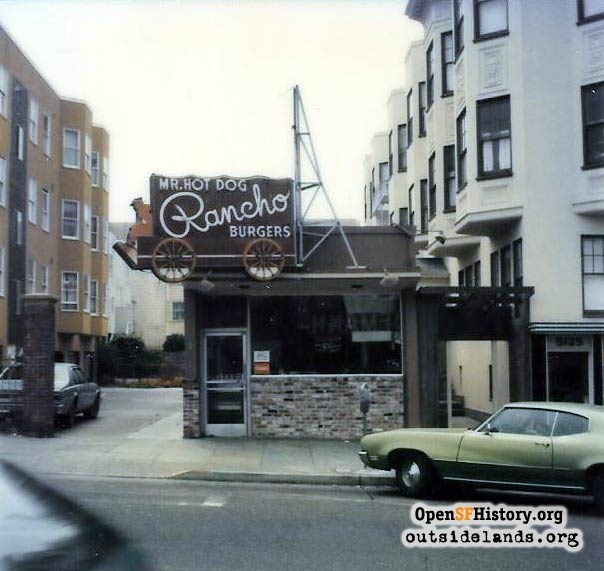 We always called it Rancho Burger, but the official name was "Mr. Hot Dog Rancho." 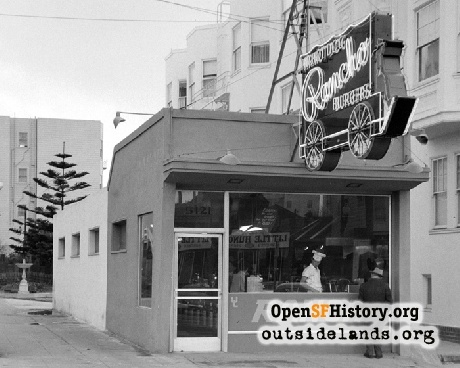 The sign hanging over the Geary Boulevard sidewalk between 15th and 16th Avenues was almost as big as the shoebox building that held the restaurant. If the Doggie Diner head can be a city landmark, the Mr. Hot Dog Rancho sign certainly deserved a commendation. In the shape of a stagecoach silhouette, the words "Mr. Hot Dog" were dwarfed by a neon scrollwork "Rancho" across the face and the neaon made the stagecoach's wagon wheels spin. Inside on the right was a counter with red vinyl stools made of milk cans. On the left was a row of booths with windows looking out on a driveway. Wagon-wheel chandeliers split the center aisle. 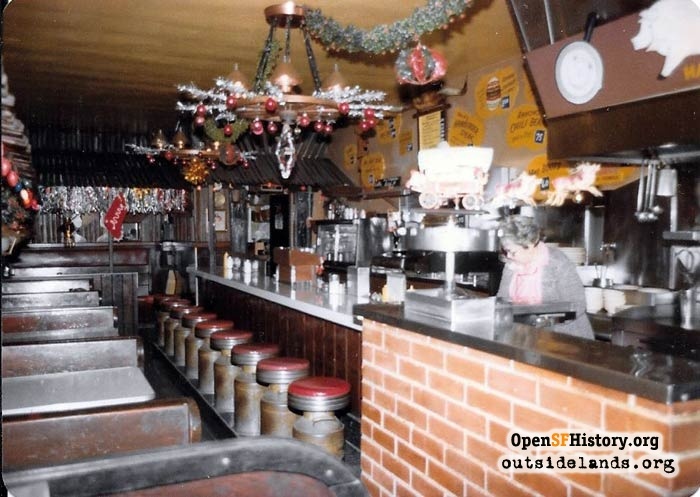 Covering the walls were western-themed cutouts advertising meatloaf, corned beef and cabbage, and New York steak ("129 pennies" in the early days). There were smiling hot dogs wearing chaps and devious slices of pie avoiding lariats. My family lived on 11th Avenue and my mother worked at Donut World on the corner of 18th Avenue and Geary. 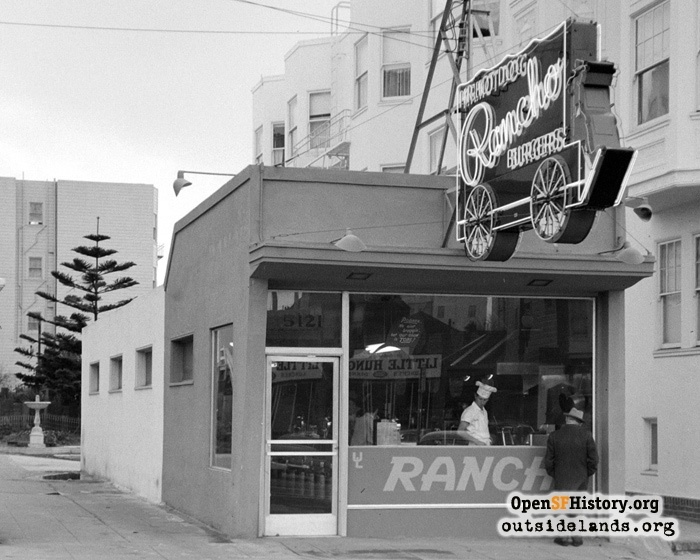 A walk between the two always meant a lot of begging for a stop at Rancho Burger. It was a place for kids who wanted to be cowboys and liked their mac and cheese advertised on a cartoon boot. Even as an adult I couldn't stay away. I had a real rancho breakfast the day of my wedding. About a decade or so ago, Rancho Burgers closed and turned into Kabuto Sushi. One more piece of my childhood gone. Recently some of the interior Mr. Hot Dog signage showed up in an eclectic odds-and-ends shop on Balboa Street called Mixed Nuts. Then Stephanie Douvris, daughter of the original owners of Mr. 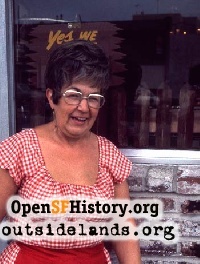 Hot Dog Rancho, found us online and generously shared some of the history with photos. The original Mr. 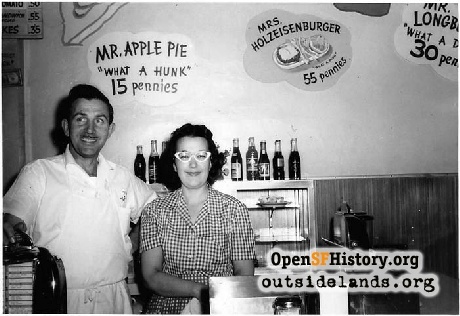 Hot Dog opened in the 1940s at 3815 Geary Boulevard between 2nd and 3rd Avenues. Stephanie's parents, Steve and LaVerne Holzeisen, opened it with LaVerne's brother Urban Louis. "They said the juke box and pinball machines would pay the rent." 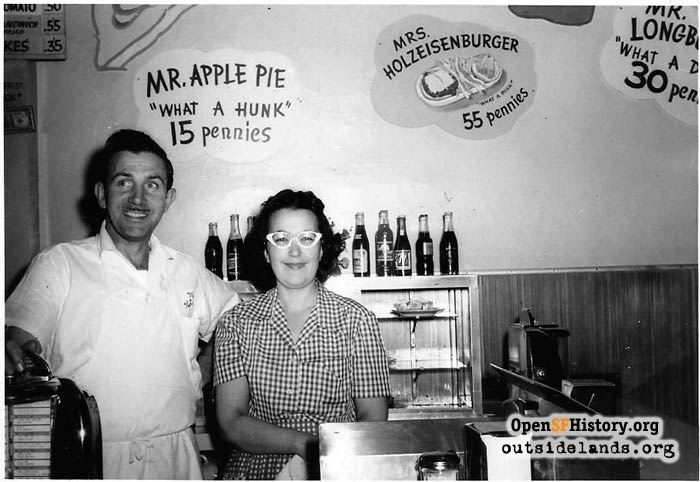 In 1946, the Holzeisens expanded to open Mr. Hot Dog Rancho farther down Geary. Like most business owners of the day, the couple lived in the neighborhood. Their daughter Stephanie attended St. Thomas parochial school on Balboa Street and Presentation High on Turk Street, while her brother Byron went to Washington High. Both grew up working for Mr. Hot Dog. America was crazy for all things western in the 1940s and 1950s—on television, on Broadway, in the movies, and in neighborhood eateries. Mr. Hot Dog Rancho wasn't even the only cowboy-themed restaurant on the block. 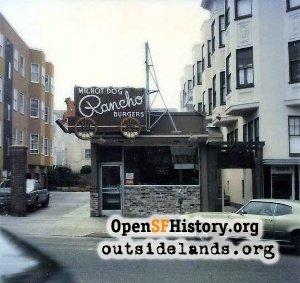 Across the street, Ranch House Dinners opened in 1953. When that venture fizzled out, the Holzeisens grabbed some of the décor—including a few giant steer horns—for Mr. Hot Dog Rancho. Stephanie says her parents hoped the kids would take over the business, "but we wanted to turn it into a coffee house and vegetarian restaurant which they thought was too bizarre. We could have been the first Starbucks!" The business was sold in 1978 and run by another owner without many changes for at least another fifteen years. Then unagi and nigiri replaced the burgers and fries. LaVerne passed away in 2002, and her husband Steve followed her on July 20, 2012, a day after his 98th birthday. In the process of emptying out his house, Stephanie and Byron sold the Mr. Hot Dog decorations to Mixed Nuts to get them out in front of the public again. Steve and LaVerne Holzeisen are interred at the Columbarium, still in the neighborhood. Their niche proudly recognizes them as "Owners of Mr. Hot Dog Rancho." Page launched 11 December 2014.